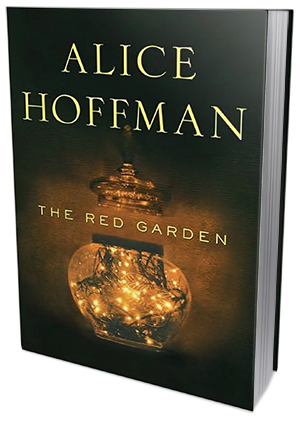 "The Red Garden" introduces us to the luminous and haunting world of Blackwell, Massachusetts, capturing the unexpected turns in its history and in our own lives. From the town's founder, a brave young woman from England who has no fear of blizzards or bears, to the young man who runs away to New York City with only his dog for company, the characters in "The Red Garden" are extraordinary and vivid: a young wounded Civil War soldier who is saved by a passionate neighbor, a woman who meets a fiercely human historical character, a poet who falls in love with a blind man, a mysterious traveler who comes to town in the year when summer never arrives. Beautifully crafted, shimmering with magic, "The Red Garden" is as unforgettable as it is moving. The Red Garden takes us from 1750 - the founding of Bearsville/Blackwell - to sometime today. Each chapter is a short story about one of the characters in the town. I love how the stories all connected to one another through one person or another. Even if the stories were only a few pages long, I found myself engaged in their lives and tracing back their lineage through the last few generations, but maybe that's just the history nerd in me. It was also fun for me to figure out how everybody connected, children/grandchildren/great-grandchildren (you get the idea) of characters from previous chapters. I did find the first stories more engaging that the later ones - sometimes around the 1950s, I believe - though I was quite fond of the last story. Something I also really liked was that in the later years, there were town "legends" of events that we witnessed/read in pervious chapters. Hoffman did a beautiful job of writing these vignettes of a town through many generations. Some stories were heartwarming, others were heart wrenching, but we can't always have that a happy ending for everybody. Overall, I was very pleased with book and would recommend it.